HNN9009 : 7.5 volt 1650mAh NiMH battery for Moto. GP328, HT750, PRO5150, Waris etc. 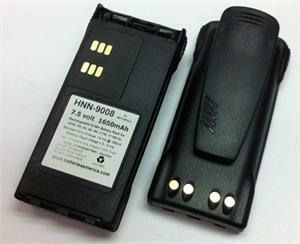 Home > Commercial-Land Mobile-Marine > HNN9009 : 7.5 volt 1650mAh NiMH battery for GP320, HT750, PRO5150 etc. 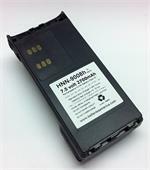 HNN9009 : 7.5 volt 1650mAh LONG LIFE rechargeable Ni-MH battery for MOTOROLA handheld radios. Fits the following radios models: GP1280, GP320, GP328, GP338, GP340, GP344, GP360, GP380, GP388, GP580, GP640, GP680, GP688, HT1250, HT1550, HT750, MTX8250, MTX850, MTX900, MTX9250, MTX950, MTX960, PR860, PRO 5150, PRO 7150, PRO 9150, PTX700, PTX760, Waris, Waris 1250, Waris 1550, Waris HT750, etc. The charging contacts on the backof this battery are approximately 1/4' up from the bottom of the battery. Replaces original #s HNN9009, HNN9008, NTN9009A, NTN9009B, HNN9012, HNN9012A, NTN9012, etc. Can be slow-charged or fast-charged. Includes heavy-duty Belt Clip.